Chef’s Choice is a brand that needs no introduction at all. With more than 100 patents, this brand is not a stranger in the realm of knife sharpening. The 320 Diamond Hone Knife Sharpener is among the best products from Chef’s Choice. Although it is not as versatile as the Chef’s Choice 1520 AngleSelect, the 320 is still considered a powerful sharpening machine. It creates superior multifacet edges on knives of any steel (carbon, stainless and alloy). Putting aside the Asian style knives, it can turn any 20-degree American and European dull knife blade sharp in a few minutes. Whether you have sporting knives, butcher knives, serrated knives or gourmet chef knives, you can be assured that the Chef’s Choice 320 sharpener can take care of it. For gourmet knives, this sharpener guarantees to bring you sharp edges that you need for a seamless food preparation. Dull knives make cooking less enjoyable so thanks to this Chef’s Choice sharpener, you can enjoy cooking again. Serrated knives are also brought back to its former glory with this amazing sharpener. All out of the line teeth are polished and reassembled that makes cutting bread and large vegetables a breeze. 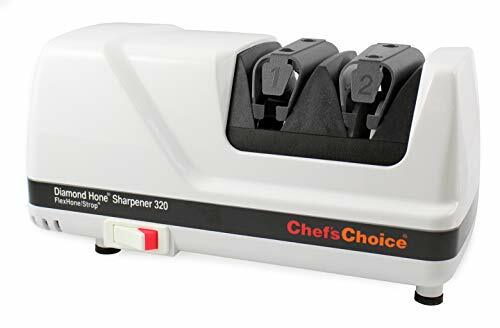 If you’re one of that serious chef and home cooks who like sharp and reliable knives, the Chef’s Choice 320 which is under $100 is your knife sharpener companion. The powerful motor and diamond abrasives combined with 2-stage sharpening turn dull knives razor-sharp in less than 2 minutes. It delivers maximum results and yet never detemper the steel blade. The double-bevel on sharpened edges guarantee knives stay sharp longer than the conventional V-shaped edges. Stage 1 uses 100% fine diamond abrasives for coarse sharpening and is best suitable for extremely dull edges. This stage creates the first angle bevel and also removes most metal. It requires at least a couple of pulls on both sides of the knife for best results. Stage 2 uses advanced micron size 100% diamond for the stropping stage which realigns and polishes the edge for a finer, sharper blade. The second stage then establishes the second angle bevel to achieve the arch-edge shape and astonishing sharpness. This is also the only stage for sharpening serrated knives. Another feature worth mentioning is the elastomeric spring that guides the blade on the sharpener. This is a well-designed feature help makes the sharpening more precise, simpler and of course, safer. The objective of the elastomeric spring is to correctly hold the blade in position so that any risks of damage will be prevented and each blade will be perfectly sharp. 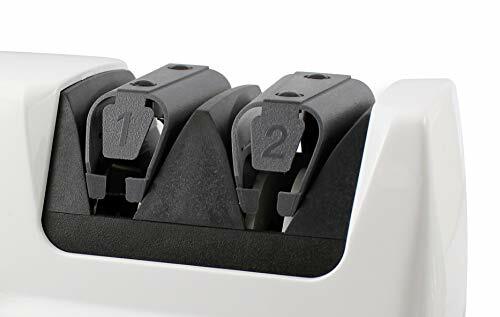 Also, most chefs claim that this feature reduces any risk of injuries, making the Chef’s Choice 320 Knife Sharpener a safer model than others. The Chef’s Choice 320 has a modern design that blends really well with your kitchen aesthetics. You can have it in 5 different colors: white, black, platinum, chrome and brushed metal finish. Out of the 5 colors, white is the most popular and the cheapest. It is easy on the eyes and of course, by hands. This sharpener has a simple design that allows simple use. Even though there is no handle, there is an obvious position for you to hold the sharpener while sharpening your knives. The 320 model may not be a high-end sharpener but the built quality almost matches up to those expensive models. The body construction is well-made, measuring 10.6” x 6.4” x 6.3“ and weighing only 1.2 pounds. The rubber stabilizing feet also serve extremely well on the countertop. There is also a simple-to-follow guide included making sure that you can master the techniques of knife sharpening. Although it may take some time to get used to it, you can easily pick up the technique in no time. Knife sharpener needs maintenance periodically. Cleaning the metal filings in the Chef’s Choice 320 is very simple. The magnet in the unit will collect the metal filings. Remove the cover below and clean the filings attached to the magnet with paper or toothbrush. No water or lubricating oils are needed. The model 320 has a built-in accessory to clean the stropping disks in stage 2. It requires electrical power in order to operate it. Read the manual first to understand the proper way to use it safely. Why the need to clean the stropping disks? To remove foods, grease and sharpening debris on the disks. Remember to always clean the knife before sharpening, this will avoid unnecessary foods and grease stick on it. The polishing stage lost its sharpening efficiency. You’ll come to know it if you take too many pulls in stage 2 to achieve that sharpness which only requires lesser pulls when it was brand new. Please use it sparingly. The more you clean it the more it’ll wear out prematurely. Cleaning means it’ll physically remove abrasive material from the surfaces of the disks. It that should occur, disks replacement by the factory is required. Of course, a one-time fee is charged for such service. 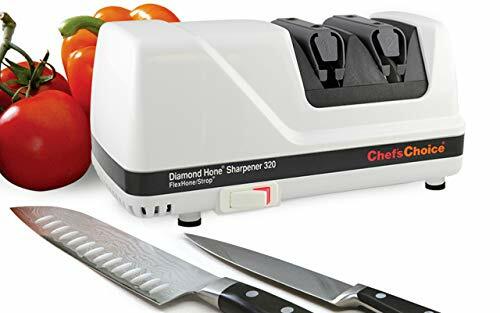 As we’ve said before, the Chef’s Choice 320 Diamond Hone Knife Sharpener is very easy to use, but of course, you need to read the manual first just to be safe. If you understand how this sharpener and its different stages work, then no special instruction is required here. You can just plug it in, switch it on, grab a knife and place it on the left slot of the first stage with the knife handle as close to front slot as possible. Smoothly and evenly, pull the blade towards you. Normally, it should only take 4 seconds to pull an 8-inch blade through a slot. As you pull the knife, the spring guides will securely hold down the knife blade to ensure no wriggling through all stages. Repeat again through the right slot of the same stage to get evenly sharpened. Perform a 3 to 5 pairs of pulls in each stage will do. Complete all the stages the first time you restore a very dull knife. Subsequently, you’ll only need stage 2 to reshape again. Some people applied downward force to the knife as they pulled. This is a mistake. Do not apply too much force to the knife. It’ll cut into the plastic enclosure. A gentle touch will deliver optimum results. The unit can get pretty loud when it is turned on. Might not be the biggest concern, but it still worth mentioning in case you despise noise, right? The motor heated up after continuously sharpened a few knives. A good alternative is to switch off the power for a while after each job. And take this opportunity to test the knife with a tomato and paper. The machine did make knives really sharp but sometimes if you’re not careful, it also made circular scratches on the brand new knives. It can only sharpen 20-degree style knives. Long live Wusthof and Henckels! How about Japanese style knives? So know what types of knives you need to sharpen first. Is This Knife Sharpener For Me? The 320 Diamond Hone Knife Sharpener is one of the best products from Chef’s Choice. Previous customers love this knife sharpener and currently score an amazing 4.5 out of 5 rating with lots of positive reviews. An estimated 80% of customers were extremely satisfied with their purchase and gave very reassuring reviews. It does a pretty good job in bringing your dull knives back to life and ensuring that they are always sharp and ready to slice. So, if you are looking for an electric knife sharpener that yields very sharp results and is not too bothered about noise, then the Chef’s Choice 320 Knife Sharpener is your best bet!